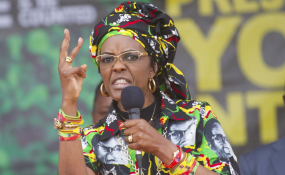 Former first lady Grace Mugabe had her voting day soured Monday after it emerged that the South African High had overturned her diplomatic immunity, paving way for her possible prosecution. The Pretoria government granted Grace the diplomatic dispensation after she was accused of beating up South African model Gabriella Engels with an electric cord in August last year. At the time of the incident, Grace's husband Robert Mugabe was still Zimbabwe's president. He would be ousted in November though a military coup. According to Reuters news agency the High Court ruled Monday that the grant of diplomatic immunity was inconsistent with South Africa's constitution. A lawyer for Afriforum, Willie Spies, said the National Prosecuting Authority (NPA) should now act to prosecute Grace and seek her extradition from Zimbabwe to South Africa. Spies said if the NPA failed to act, Afriforum would start proceedings against her. "The ball is in their court now," Spies said, adding that Afriforum had argued that Grace committed the attack on Engles while she was on a private visit to South Africa and therefore did not qualify for diplomatic immunity. Last August, Engels who is being represented by Afriforum, an advocacy group filed a court application challenging the government's decision. Grace had returned to Zimbabwe after she was granted diplomatic immunity. It was her defence that she was the victim not the other way around. Grace said Engels was drunk adding that the model attacked her with a knife. Engels dismissed Grace's defence as lies. Engels testimony is that Grace attacked her when she was seated in a hotel room with her two friends waiting to one of her sons in August last year. Grace is accused of having assaulted Engels with an electric cable while chasing the girls away. Engels sustained some gashes on her head and bruises on her thighs. Reuters reports that NPA spokesperson Phindi Mjnonondwana said the case was still in the hands of the police and had not yet been sent to the NPA for action. NPA spokesman Luvuyo Mfaku said South Africa and Zimbabwe had previously cooperated on extraditing suspects from one country to the other.